The Leigh and District Historical Society has been concerned for some time that there has been no record of the impact of the Second World War on the village and people of Leigh. Many years have elapsed and the memories of these events, though still clear in many peoples’ minds, are inevitably beginning to fade. We have been aware that time was running out. We have therefore been fortunate that Morgen Witzel, a Canadian researcher who has lived in the village for several years, has offered to pull together all the available information. There are many people still in the village who lived here during the war and a number of them, together with others who had moved away but were tracked down through the local media or by word of mouth, were interviewed by Morgen. We are most grateful to them for sharing their memories. Their information has been supplemented by material from the village ARP log, which was kept meticulously right through the war and had been retained by the parish council in their safe; this proved to be a fascinating document. Local newspaper archives, particularly the Tonbridge Free Press, and official documents kept at the Public Record Office in Kew provided further information, and more valuable insight into the period was gained from the diaries of Sir Eric Macfadyen who lived at Meopham Bank and owned land in the parish of Leigh. 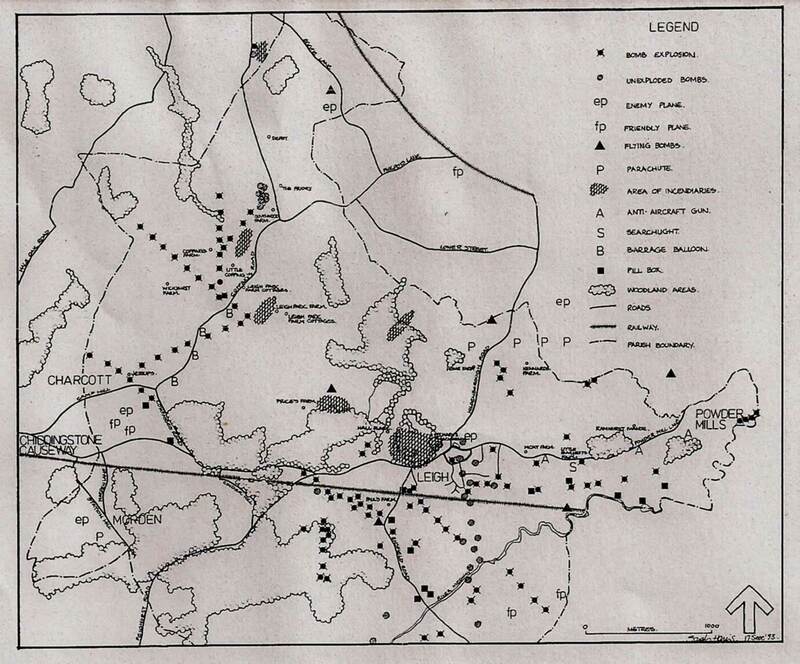 Information from all of these sources is included in this book and has been consolidated onto a map of the parish which is reproduced inside the back cover. The Society is indebted to a number of people who have contributed to this publication. As well as those who were interviewed or contributed information, Chris Rowley, John Knock, Mary Dyson, Janet Donald, and Belinda Forster helped locate people to be interviewed and suggested lines of inquiry. Harry Lucas, chairman of the parish council, lent the ARP log, and Maurice Martin lent copies of photographs of the Messerschmidt crash at Old Kennards. 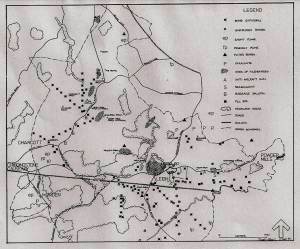 Monty Cairns and Heather Maugham cooperated in producing the front cover, James Cook and Lawrence Biddle proofread the manuscript, and Sarah Harris drew the map showing where the bombs fell, aeroplanes crashed, and other events which occurred in the area. Finally, we are grateful to the Macfadyen family for permission to quote from Sir Eric’s diaries. We hope that you will find this record interesting and informative. Its preparation has certainly given us much pleasure and satisfaction; we are very aware, however, that we have not yet unearthed all there is to know and the Society would be delighted to hear from anyone who has additional information to offer.